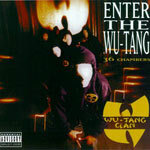 ''Wu-Tang killa beez, we on a swarm!'' Classic lines from Wu on the first release! This album, front to back, is off the hook! This album changed the face of hip hop forever. No collection is complete without it.